Dreamforce is just around the corner! It's my pleasure to introduce you to one of my Dreamforce co-presenters, Norman Krishna. Norman has built release management from the ground up at small, medium, large, and super-sized organizations. Now, as a DevOps Architect, he is able to bring his meticulous organization and delivery processes to every aspect of a project. Norman and I worked on a large enterprise Service Cloud implementation last year. On the project, I was staffed as Technical Lead and Norman was the Release Manager. During our time on the project, Norman and I had a lot of fun reviewing and exploring concepts of release management and deployment best practices. We spent a lot of time planning and building deployments, and worked through each release to refine our success criteria necessary for solid subsequent releases. Working through deployments with defined processes and common success criteria ensured every release succeeded, but we were always ready to execute a deployment rollback, if needed. Given our experience together and his expertise on the topic, Norman was an obvious pick for co-presenter of "Where's the Undo Button? Deployment Best Practices" this year. In the event that you promote something to production that causes your users or stakeholders grief, three strategies we are sharing during our session will help you to restore production to a steady state. 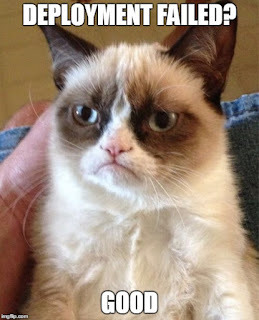 Grumpy Cat doesn't know we have an undo button. We hope that you can join us for the session and we will be sharing more information about deployments and release management in the coming weeks. Learn more about Norman in the following digital interview. How long have you worked in an IT-type function? Have been in IT all my life -- starting from hardware Engineering support, software development, sales, general management, entrepreneur and now in Salesforce DevOps - it has been a great journey. What I love about my job is that it is constantly evolving. And Appirio has given me a great opportunity to work with a series of new enterprise clients (approximately one every year) and each of them are different in IT culture, infrastructure and processes. What is your current role like? What does it entail? Currently, I am a DevOps Architect - primarily involves working with Dev teams to ensure that complex Salesforce applications are moved from development sandbox through qa, uat and finally production involving multiple IT teams and disciplines. Do you have any advice for IT newbies/admins in the Salesforce space (in general)? Salesforce is a fantastic platform offering a diversity of experiences. You should have an open mind and be able to switch into multiple career options - Business Analyst, Developer, DevOps, Data Specialist, Integration specialist, Program/Project Manager. And remember - certification is also important. What is your favorite feature of the platform? Spinach smoothie with kale and chia seeds. What was your Salesforce certification journey like? How did you achieve your cert? Would you encourage others to attempt certifications? Actually, the best was my last one Software Development Life Cycle -- spent a couple of weeks reading through the reference material and passed the first time. Certification means more pay rises and most material is available online. Did you have any mentors along your career journey? Who? How did you find them? Many of them - but Appirio has a wonderful mentoring process and I am fortunate to get a great mentor. And I also mentor others when needed. Any books we should read or podcasts we should listen to? No one other than the legendary Jeff Douglas. Any television shows or movies we should watch? Glen Garry Glen Ross - shows human emotions at it's best and worst - and also a great cast. What was the silliest request you've ever fulfilled? No requests are silly - what you need is to educate the requester. What is the most common request you're happy to fulfill? Architect a Release from scratch. Any AppExchange apps/Git repositories/other technological items worth a nod? Too many to list - but the best is Copado - a DevOps tool that nearly automates 99.99 of releases --expensive right now - but may become the market leader in future.